St John of God Subiaco Hospital Oncologist Dr Andrew Dean and patient Graeme Zorn. Photo: Supplied. St John of God Subiaco Hospital is the first facility in the world to offer patients a new drug to help treat pancreatic cancer as a part of a world-first in-human clinical trial. Oncologist Dr Andrew Dean is leading the CEND-1 trial at St John of God Subiaco Hospital with the first two patients in the world starting treatment with the trial drug in September 2018. 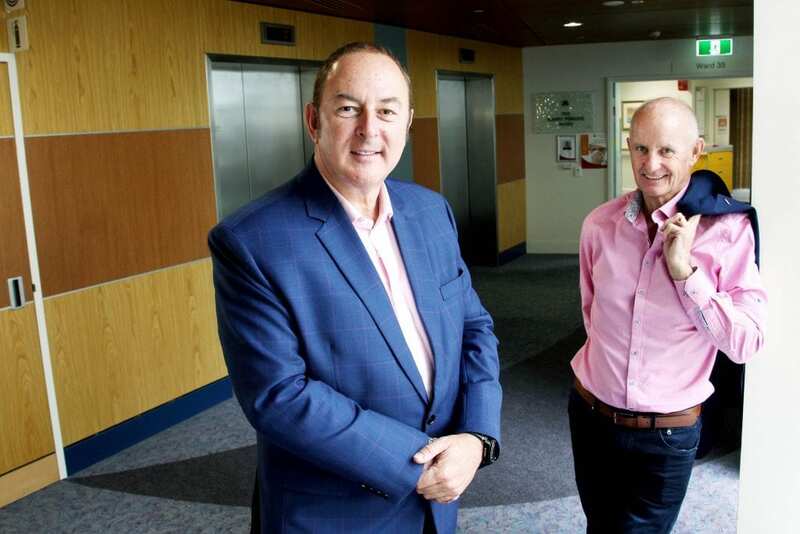 “We are the first in the world to trial this brand new drug which hijacks a protein that the cancer cells normally use to feed themselves, and instead the drug makes the cancer cell feed on chemotherapy,” Dr Dean said. “This drug is being trialed with the current gold standard chemotherapy for pancreatic cancer. Pancreatic cancer is the fifth most common cause of cancer deaths in Australia and is the 10th most commonly diagnosed cancer type. The risk of pancreatic cancer increases as you age, with men at slightly higher risk of diagnosis than women. “While this trial is still in the early days, if it is successful it could potentially make a huge difference to survival from metastatic pancreatic cancer and could lead to a whole new strategy to beat this disease,” Dr Dean added. The trial is a significant milestone for SJOG Hospital as well, as it is the first in-human clinical trial to occur at the hospital. SJOG Subiaco Hospital Chief Executive Shirley Bowen, said this trial placed the hospital at the leading edge of cancer research and treatment. “We have a dedicated group of oncologists who are committed to providing the most advanced treatments for their patients who we care for in our world-class facility,” Prof Bowen said. “We have a number of trials on the horizon that our doctors are investigating to see if they can help our patients battling cancer.